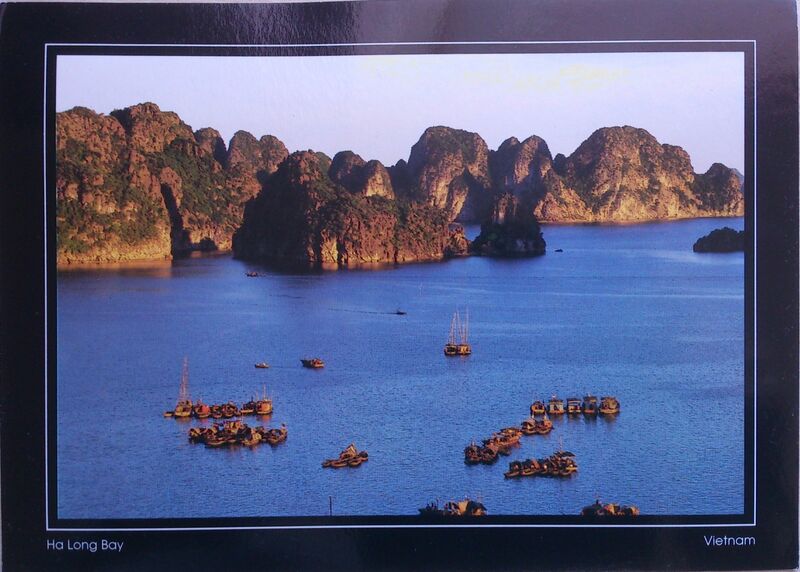 This gorgeous card, my first one from Vietnam, comes from Yi Ting who lives in Saigon. Ha Long Bay (literally: “descending dragon bay”) is a UNESCO World Heritage Site, and a popular travel destination, located in Quang Ninh province, Vietnam. The bay features thousands of limestone karsts and isles in various sizes and shapes. According to local legend, when Vietnam had just started to develop into a country, they had to fight against invaders. To assist the Vietnamese in defending their country, the gods sent a family of dragons as protectors. This family of dragons began spitting out jewels and jade. These jewels turned into the islands and islets dotting the bay, linking together to form a great wall against the invaders. Under magics, numerous rock mountains abruptly appeared on the sea, ahead of invaders’ ships; the forward ships struck the rocks and each other. After winning the battle, the dragons were interested in peaceful sightseeing of the Earth, and then decided to live in this bay.